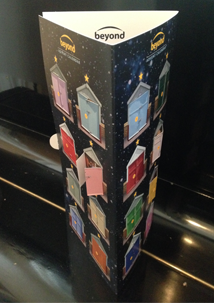 Unique 3D design Advent Calendar featuring the Brighton & Hove beach huts and images from the annual Beach Hut Advent Calendar. The doors of each hut open to reveal some of the highlights of the last ten years and more images are featured on the reverse along with information about the event. For orders of 10 or more, please contact us.